Last seating at 8 p.m.
Having the privilege of living in Salt Lake City, we often lose sense of the fact that we are deep in the heart of this worldly recognized Mountain West region. It is healthy, from time to time, to displace from city life, and transplant ourselves into these mountain towns to take breaks from this reality. While many travelers will find themselves in Wanship, the ambitious adventurers continue farther up the road to experience the majesty that is the Blue Sky Ranch, home to High West Distillery and Refectory. High West is entering their fourth year of residency since having built their headquarters on the ranch. Guests are welcome to tour its facilities and take part in the Refectory’s Supper Club Series every Thursday evening throughout the winter season. By design, these evenings were created to accentuate the cabin lifestyle and its finer culinary traits through an intimate four-course set menu ($40) with loved ones and friends alike. As reservations are customary, guests arrive at the gatehouse punctually and are ushered into a shuttle ready to take the short, winding drive up to the distillery. Migrating to the peak of the distillery roundabout, the driver tells tales of Blue Sky’s equestrian heritage as well as how new renovations are expected to double High West’s bottle production in the coming year. Adjacent from the actual distillery is the Refectory, where guests are greeted and shown through a whiskey-barrel-clad hallway into the main dining room to settle in. As the waitstaff greets us, the table is informed of what the set menu for the night will be and is asked about dietary restrictions. There is a sense of pride in knowing that there is a separately handcrafted menu every Thursday and that it will be different every time. This is around the time when the bartender makes their way around the room, educating the patrons on whiskey pairings for dinner as well as explaining High West’s extensive cocktail menu ($14 cocktails). In this scenario, the Doubly Rye! Manhattan is decided on then followed by a whiskey flight ($14) throughout the meal. As the Double Rye! makes its appearance alongside the amuse by bouche, it is noteworthy to add that the younger of two whiskeys in this double-rye blend, for the first time this year, has actually been produced in this relatively new distillery. The amuse tonight is a crunchy rye cracker topped with pastrami, Gold Creek Fasiago cheese and a spicy whole-grain mustard. Combined, this bite delivers a sharp, crispy palate awakening that plays off the Double Rye!’s caramel notes. The first course follows swiftly. Coexisting with a mix of mountain greens, pickled beets, feta and tomato, a honey wine reduction sweetens the raw vegetables, while a local red-wine vinaigrette adds a needed acidity. 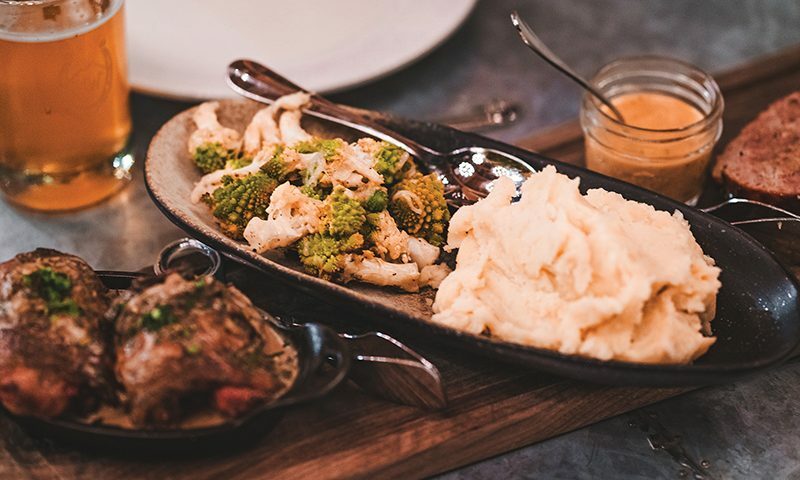 It’s in these two dishes alone that the guests should continue to expect more European-rooted recipes delivered through indigenous mountain delicacies. Pair with the Yippee Ki-Yay to accentuate the fruit notes hidden within the whiskey and dressing. In a well-timed manner, entrées and sides make their way to the table in a generous array of family-style preparation. At first glance, a smoked chicken forestiere can be seen bathing in a buttery white-wine-and-mushroom sauce served next to an elk meatloaf. 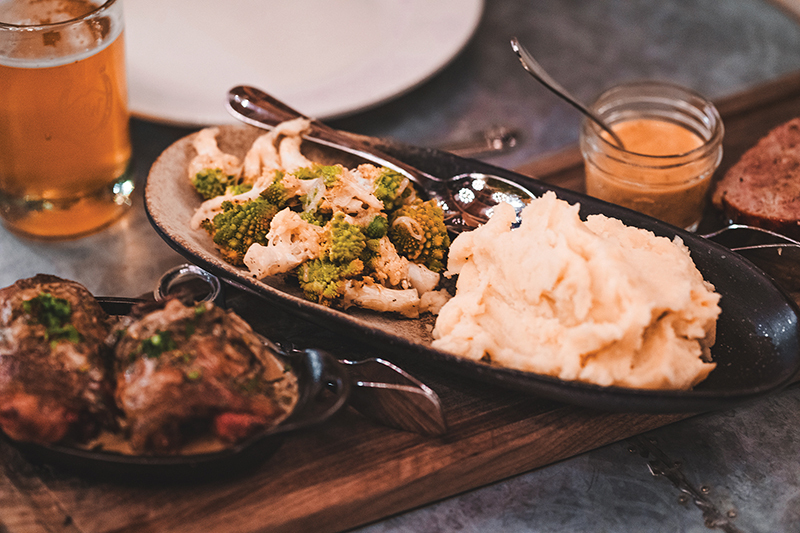 Between the two main courses is a plentiful bowl of mashed potatoes, a side of gravy and a romanesco baked with gruyere. The elk is gamey enough to assert that it was once wild, yet tender enough to assert that dousing it in thick potatoes and gravy is the only way to eat meatloaf. The same also goes for the lightly smoked chicken thighs, as they could not fall off the bone more if they tried. Whatever of the mushroom sauce that is leftover should be finished with the carefully cooked romanesco, if not drunk. This is what Anthony Bourdain would be eating if he interviewed Leo DiCaprio at his cabin in The Revenant. Pair with the Rendezvous Rye to complement earth tones in this soul food. It’d be a shame to say that this evening’s experience comes to an end, but at least it’s finished with Dutch-oven-style apple cake and bourbon whipped cream. The apples at play here are thoroughly cooked into the fluffy batter, yet firm enough to have a crisp retention. For those seeking out a nightcap, the Midwinter Night’s Dram is a taste of the best that High West has to offer, however, the scotch lover of the group might lean toward ending the meal with the Campfire whiskey. Whichever is chosen, it will have been well worth the travel and hopefully not too far from a comfy place to sleep off the winter’s cold.